Sunday February 12, 2017 High school students from across the islands competed in the statewide finals of Poetry Out Loud: National Recitation Contest at Tenney Theatre, home of Honolulu Theatre for Youth. 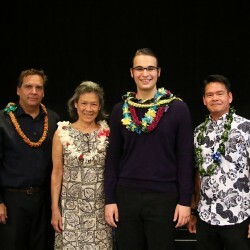 Returning State champion, Nicholas Amador (11th grade), of Punahou School will once again represent the state of Hawaii at the 2017 National Poetry Out Loud competition in Washington DC. Nicholas was awarded $200 check from the National Endowment for the Arts, and his school received a $500 stipend for poetry books. In addition, Nicholas, will receive an all-expenses-paid trip with chaperone to Washington, DC, to compete in the National Finals, April 25-26, where $50,000 in awards and school stipends will be distributed. Nicholas, represented the state and took third place in the 2016 National Finals in Washington, DC, last May. Second place winner is 12th grader, Tiffany Kanoa, of Mid-Pacific Institute. Tiffany was awarded a check for $100 from the NEA and her school received a $200 stipend for poetry books. Poetry Out Loud is presented in partnership with the National Endowment for the Arts and the Poetry Foundation, and administered in Hawaii by HTY and the Hawaii State Foundation on Culture and the Arts.